Twins teething, yikes! Loads of parents will find their twins teething at the same time. This is generally due to simply being the same age. 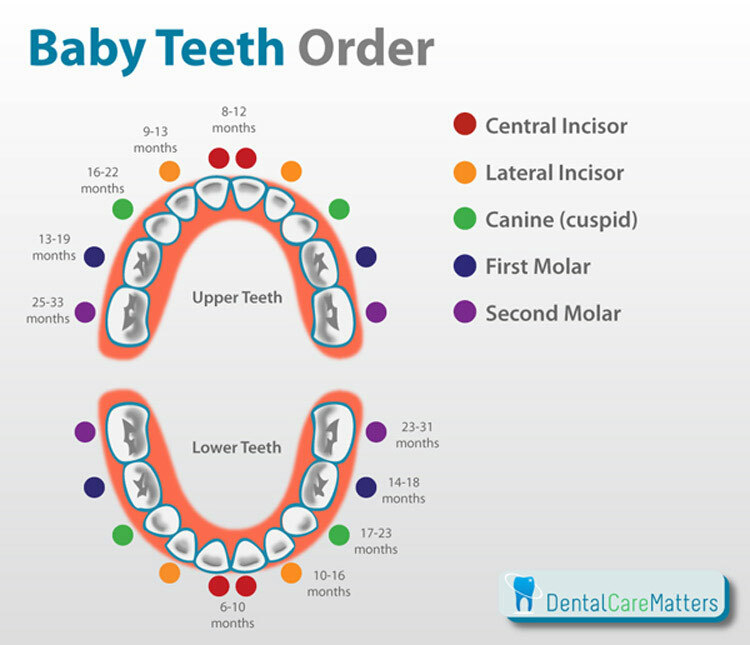 But, because those first little teeth can crop up anywhere between 4 and 9 months (on average), this leaves a lot of opportunity for different teething stages between twins. Not to mention, you could get two completely different reactions from each child, as well. It should be noted, identical twins will almost always start teething at the same time. So be prepared if you have identicals! Below we'll go over the most common signs of teething with twins along with the corresponding remedy options when dealing with teething twins. Be sure to check out the teething chart at the end too! Sign: Drool! Drool! And More Drool! This definitely tops the list of symptoms with teething twins. Although, drool typically starts in the early months of babyhood, teething seems to stimulate it. All that extra saliva can also cause the unpleasant side affect of skin rashes around the mouth, chin, and even neck (just about anywhere saliva sits on the skin). 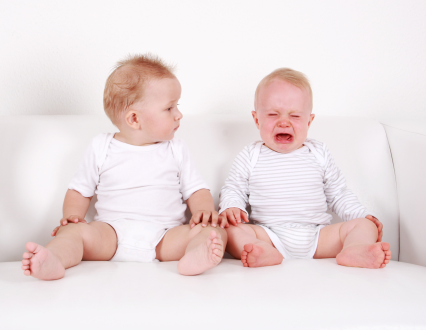 You may even find one twin experiencing more drool and/or rashes than the other. A bit of a cough and/or diarrhea is another common side effect caused by the excess of saliva. But, do check with the pediatrician if you suspect there may be another cause. Well, unfortunately, there's not much you can do to stop the flood. But, you can make your babies more comfortable by keeping their faces and necks as dry as possible. Be sure to have a clean cloth around, as well as plenty of dry bibs to change out. You may also want to apply a bit of pure lanolin ointment on babies skin to help act as a barrier. This is another one of the more predictable signs. You will likely find teething twins chewing and gnawing on just about anything they can get their hands on (including their own hands and fingers! ), and more excessively than usual. Swollen, inflamed gums may be noticed during this stage too. It's the feeling of counter pressure on the gums that helps to relieve some of the discomfort, hence all of the chewing. Be sure to have plenty of teething items available for your twins. Things like teething rings, which can be refrigerated, are great. Many parents have also found a cold, wet washcloth a handy alternative for gnawing on. You may want to keep a stock of clean, cold teething toys in the fridge or freezer. When you find yourself dealing with both twins at the same time, it's always good to have plenty of supplies! We know that teething is painful. Even adults get cranky when they are in pain. So, it's no wonder this particular sign will show itself in varying degrees with teething children. You can usually bank on it being caused by teething when it is accompanied by the other symptoms listed here, but dont forget to consult the pediatrician when in doubt to rule out any other ailment. Depending on how fussy your child is, you may want to first try a homeopathic remedy. Hylands Teething Tablets are 100% natural...These are a popular choice with parents and great for teethers, but consult your pediatrician first. Another option is to use a numbing gel on the gums, however they tend to wear off quickly. And finally, dosing with children's *Tylenol or Motrin may be necessary and the most effective in soothing teething babies. Many twin teethers are still taking a bottle or breastfeeding. Sometimes the act of sucking can intensify the pain of teething and thus, the child will refuse bottle and/or breast. Additionally, a loss of appetite is common when experiencing discomfort. If your child is old enough to eat solids, you may want to try giving cold yogurt or applesauce. When this is not an option, you may need to dose with children's *Tylenol or Motrin first. When your child is once again comfortable, he may then be able to take a bottle or breastfeed. Be sure to contact the pediatrician when your child completely refuses to eat or drink for more than 24 hours. 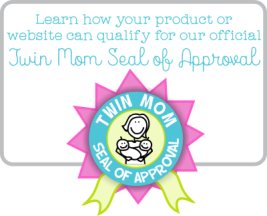 This is frequently associated with twins teething. 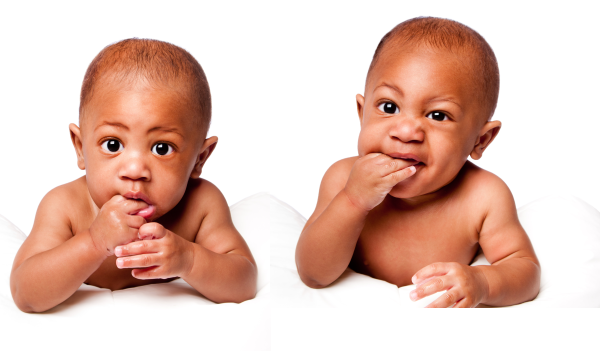 Your twins may have already been sleeping through the night, only to start waking up from teething pain! Without the activity and distractions that go on during the day, this pain may be amplified to a teething child. You may perhaps want to give your child a cold teething ring when you put him down to sleep. When sleeping issues persist, it might be a good time to reach for an over-the-counter remedy like children's *Tylenol or Motrin. A child suffering from teething pain coupled with lack of sleep is not going to be fun. Add teething twins into the mix and you have a recipe for disaster! *Always check with the pediatrician or other healthcare professional about when to administer pain relievers or homeopathic remedies. 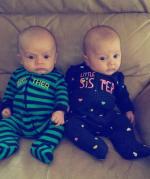 "My identical boys started teething within days of eachother. They continued to be on the same teething schedule throughout the entire process. Luckily, they weren't too fussy. God must really love me!" "I had boy/girl twins teething a whole 2 months apart. At first I wondered if my son would ever get any teeth, but the pediatrician assured me that they would eventually come and they did. It was actually a big help to not have them suffering at the same time!" If you're in a real pickle, try giving your child an unopened bag of frozen peas or corn. You will need to closely monitor that they don't gnaw through the bag. This works best when the teeth have not quite broken through.